Copyright © 2012 Stephen Hawley, all rights reserved. 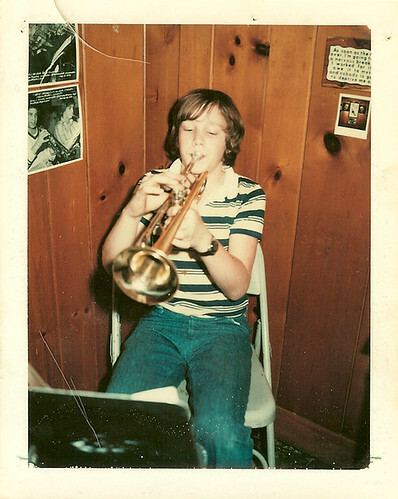 In 1980, after playing trumpet for about 4 years, I started to get bored with the instrument. My teacher, Miss Frisk, who taught band out of a cafeteria storage room, realized that she had reached the limit of what she could do with me. 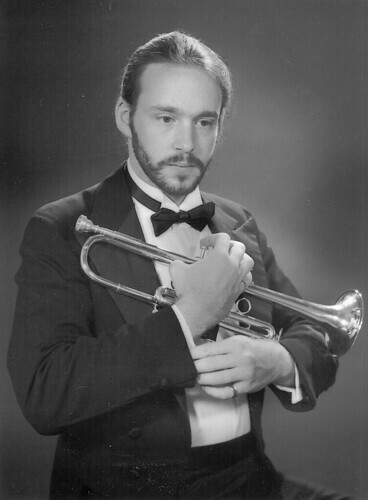 I had just finished the last trumpet method book that the school had in its library. She called my mom to let her know. My mom called the high school band director to find out who were the better players and then called their moms to find out about who was teaching their sons or daughters. She ended up hooking me up with Joe Loreti, who was a perfect match. Mr. Loreti passed away on October 27th, 2012 and I will miss him and I will miss the gifts that he gave me over the years that I took lessons from him. When I took my first lesson from him, he had me sit down and warm up (warm up? what's that?) and asked me to play whatever I had been working on. I took out my band method book and played an excerpt from the Carnival of Venice which was really only the initial theme and some traditional variations. After I was done, he took out a battered copy of Arban's and flipped to the back and proceeded to play the first variation cold and with a beautiful round tone. My jaw dropped and I left with a list of books to get: Arban's, Clarke, Schlossberg. Each book had a different goal. I still have each one. Over the years, I learned to love playing duets with Mr. Loreti. He matched intonation incredibly well and how he blended his tone to mine. In the beginning, I played about 1/3 of the lesson and he played the other 2/3. At the end, when I was a senior in high school, he hardly played at all. There was nowhere for me to hide. One thing he did was to assign me an aria or two to learn over the span of a week with the goal of coming back and playing it rubato and to interpret the musicality of it. I would play. He would listen. If he was unsure of what I did, he would ask me to play again. Then he would tell me what I did and ask me if I meant to do it and why. Later, I would get these assigned and would have to transpose. Up a step, down a step, up two steps, down two steps, up a third, up a fourth, down a fifth. And this was his way - he taught me how to be a working trumpet player. Someone who could show up and play a piece right the first time even if it was in the wrong key (which it frequently was). He taught technique through music, not music through technique. As a junior in high school and into college, Mr. Loreti got me gigs playing in churches and in the pit for the show Brigadoon. I routinely got calls from his overflow. When I was home for Easter in college, I got a rare treat. He invited me to play at his church for the Easter service with him, his son Steven, and Wendi Shermer (one of his other students). The reason it was a treat was that we all had the same tone. We all had his tone. Playing with this group made the hair on my arm stand up on end because of how rich we sounded that day. Into adulthood, I still played. I found that I couldn't put the instrument down for too long or I would get ill. Making music helps complete me. I've always loved the smaller trumpets (Eb, D, Piccolo) and now a responsible adult, I found the means to own these and set myself the goal of playing Telemann's heroic marches as well as getting my Hummel back into gear. I went home to visit my mom and gave Mr. Loreti a call - could I come by and get a lesson? He agreed and we spent a half hour catching up and then I pulled out the Telemann and went through the first march, La Majesté and after playing it through he said, "there's nothing wrong with that" and turned the page. I can't say the rest were as good, but it was great encouragement. I will miss him dearly and will always be grateful for the gifts he gave me. Day 31 of 31 for 21. I'm going to ask you all a favor. It's going to be a hard task for you, but I hope you can do it. Be better than me. I'll admit to having a fair amount of ignorance and prejudice about Down syndrome. My closest contact was a boy in my grade in junior high who had two younger sisters with Down syndrome. We didn't see them that much and I don't recall them going to our school. I knew it was a genetic disorder. I could recognize people who had Down syndrome, as I think most of us can. I've learned a lot more personally. If you've read my blogs, you've had the opportunity to learn from me and I invite you to be better than I was. To be more accepting, more understanding, more welcoming and so on. Be aware that when you see us out with our kids, we're probably working towards some goal other than the obvious ones. For example, if you see me shopping with Alice, we're actively working on organizing, planning, reading, and social skills. If I redirect her away from you and you here me say, "Alice, rule?" and Alice replies, "no talking to strangers." It's not because I don't trust you, it's that Alice has no anxiety about talking to strangers and no apparent judgement as to who she can and should talk to. Not yet. The thing is, there is really only one demographic that is still consistently marginalized or picked on, and that's people with cognitive delays. We I in the same circumstances 15 years ago or so, I would've used the word 'retarded', but our society has successfully destroyed the correct usage of that word. This is same population that is responsible for the marginalization because it's harder for the cognitively delayed to fight back and speak up as self-advocates. Be better than me. See a joke in a movie making fun of someone with Down syndrome and ask if the joke would've been racist if the person was African American or Chinese or any other group. If the answer is yes, then stand up and express dissatisfaction. If you run a business, consider hiring a person with Down syndrome or a person with cognitive delays. There are a number of programs that include job shadowing to help people succeed in their jobs, but many can work quite well and independently. Be better than me. Don't assume lack of ability. Take people with Down syndrome as unique individuals with feelings. Don't treat them as if they are invisible and talk around them. Talk to them too. It may take longer for everyone to be understood, but you can take that longer road. You can do it. I trust you.